Ball Aerospace has handed over the National Oceanic and Atmospheric Administration‘s first Joint Polar Satellite System to NASA after the completion of a satellite acceptance review. 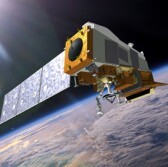 The company said Thursday the acceptance review showed that the JPSS-1 weather satellite, which now operates as NOAA-20, satisfied on-orbit requirements. Ball Aerospace-built NOAA-20 launched in November 2017 aboard United Launch Alliance’s Delta II rocket and now navigates the equator 14 times on a daily basis to provide measurements of the land surface, ocean and atmosphere for use in weather forecasting. NASA is expected to transfer operations of the weather satellite to NOAA. Ball Aerospace also built the Ozone Mapping and Profiler Suite-Nadir instrument, provided satellite launch support and testing and integrated into NOAA-20 other instruments that were produced by Raytheon, Harris and Northrop Grumman. Ball Aerospace will also produce OMPS instruments for NOAA’s follow-on, polar-orbiting satellites JPSS-2, JPSS-3 and JPSS-4.